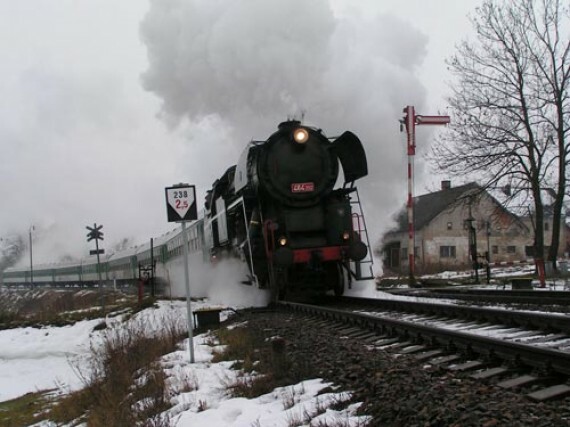 This year Czech Rail (CD – Ceske Drahy) together with Prague 5 local youth centre (DDM-Dum Deti a Mladeze) has once again organized several traditional St. Nicholas (Svaty Mikuláš) Steam Train Rides for the young as well as the young at heart. All in the honour of a famous bishop who lived almost 2 centuries ago. On Saturday 29th and Sunday 30th November, the so-called ‘four-wheeled’ steam train (Ctyrkolak – serial number: 434.2186 – for all train buffs out there), will depart from Branik Railway Station (Prague 4) on 8 separate occasions. The whole trip takes about 1 hour (slightly longer trips are also available) with the steam train basically driving up one track and then returning the same way that it came. 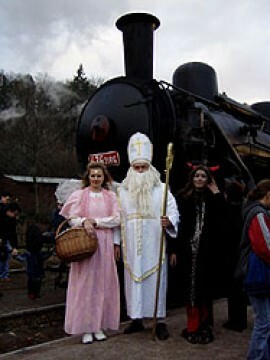 During the journey, St. Nicholas and his entourage (the devil and angel) will walk from carriage to carriage asking all children whether they have been good or bad this year. Obedient children will be rewarded with a small gift from St. Nick but those who were naughty will be given burnt coal pieces from the steam engine by the devil himself. Last year, we took the 5pm train trip which departed around dusk. The whole experience was very atmospheric and left quite an impression on all of us. The carriages were old and rickety, with traditional wooden seats. There was one other Czech family in our compartment. About 10 minutes into the journey, all of the light were switched off and one could only rely on the light coming from the houses and street lamps outside. 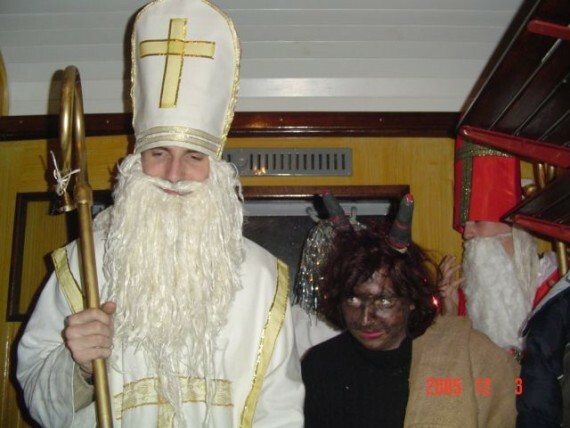 Eventually, St. Nicholas came around with the Devil and Angel in tow. Thankfully, the devil was out of luck on this particular occasion, as we only had ‘good’ children in our compartment. Albie was 2 and Robbie 6 at the time, and although both were suspicious and a bit wary of the ‘black one’, they didn’t burst into tears at the sight of him. Naturally, some little ones could get intimidated and perhaps a journey earlier in the day, before it gets completely dark outside, would be more pleasant for them. It is unlikely that any of the staff at the ticket windows or on the train itself, will speak any English but this is just one of the things that make these annual Saint Nicholas Steam Train rides, a truly authentic Czech experience. St. Nicholas Day, which is usually acknowledged on the anniversary of his death on 6th December 345AD, is celebrated differently in many parts of the world but in the Czech Republic, it is usually on the 5th or 6th December. This is when most children will await the arrival of St. Nicholas in either their home, kindy or primary school. If they have been good, St. Nick will fill their empty stockings or gumboots with sweets and other goodies but those who have been naughty and disobedient get given potatoes or coal by the devil instead. 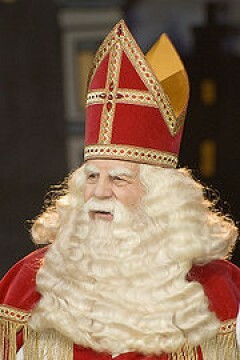 St. Nicholas, is usually clad in a bishop’s clothing, with a cape and long white beard. This goes back to Medieval Europe, when the local priest would be informed about children’s behaviour by their parents and then personally went to visit their homes to either give praise or to reprimand. 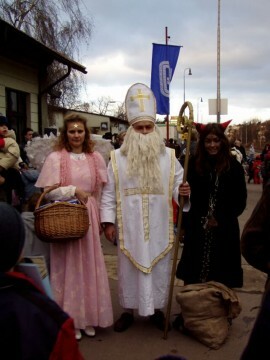 St Nicholas (Mikuláš) is often also accompanied by an angel (anděl), who acts as his assistant. The angel also acts as a counterweight to the ominus devil (čert). The modern-day Santa Claus that brings presents to children in most Anglo-Saxon countries around the world, was in fact derived from St. Nicholas himself. The trains depart Branik Train Station on 29 and 30 November at 9.40am, 11.30am, 2.08pm and 4.50pm. The train takes one of four different routes, click here for detailed route information. Tickets are: 0-6 years = free (they have no right to a seat – but usually there is plenty of space to sit down), 6-15 years = 60 CZK; 15 years and up = 120 CZK. To reserve a seat (mistenka) = 20 CZK. Pre-purchases can be made at Branik Prague Railway Station from 7am-18pm, daily. DIRECTIONS: By Metro take Red line C, get off at Kacerov station and then catch bus no:106 to the end station. If driving, an outdoor parking area exists in front of the railway station at Branik.